Had planned on meeting up with a friend downtown for dinner. Since I had a tough day, all the more reason to go. 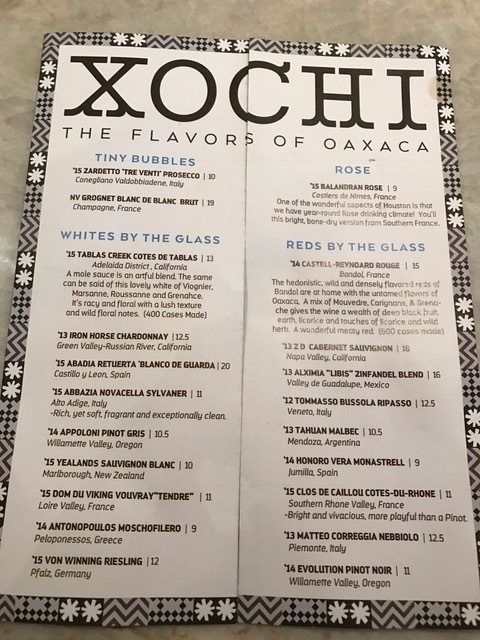 I've heard a lot about Xochi, and since it's done by Hugo Ortega, owner of Hugo's, it peaked my curiosity. Munchy chips to start, nice and warm, and addictive... make sure you save room for the main course. Sorry for the sideway pictures, couldn't fix it for some reason. But this is the Atun, which is tuna seared, jicama, the center brain looking thing is mangosteen, which is nice and sweet. there's also slices of citrus on there. If you put the tuna, fruit, jicama, and the mole sauce in one bite, you'll find it very divine. A lot of Yelpers were bragging on the braised cheeks, figured, why the heck not?! I will say, this is better shared than have alone. It does get heavy and it is thick. However, the meat is super nice and moist. You stick your fork in it, and it just falls apart on its own. Very nice! 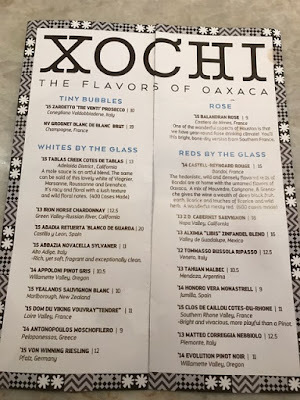 This is recommended by the server, and it is Elote Cremoso, which is sweet creamy corn and rice, but the consistency came out more like risotto and cheesy than corn flavored. It's a nice balance with the braised cheeks. I will say, as good as that is, it too will fill you up. Best shared and not horde. Last but not least, the dessert, had to save room for that. Heard a great deal of their chocolate menu, how can you not, if you're a chocoholic! If there's 2 of you, they do recommend the table side hot chocolate, which they make in front of you. Instead, I got the Cremes de Chocolate, which is a thick chocolate pudding, with sponge cake, peanut powder and did you see this awesome chocolate branch? So cool, we didn't want to break it apart, but had to try it out. So good. It was not heavy, doesn't put you over the top, but provided a sweet ending to the evening. Just so you know, make sure you make a reservation, as you don't know what event downtown might take up the entire restaurant. Bar service was great, so don't get discourage if you don't get a table. There are 2 entrances, one thru the hotel, and the other is street side facing Discovery Green. If you do drive down there, tell the valet, so they give you a special ticket, and parking there is $6. The hotel is nice, and you can walk to Discovery Green.